Shorts — check. T-shirts — check. Sunglasses — check. Bathing suit — check. Sun screen — check. And library book — check. All packed in your suitcase for spring break. University Libraries, in partnership with the Toledo-Lucas County Public Library, is encouraging UT students to take advantage of a week away from studies to read. Not textbooks or research articles, but reading for pleasure. Check out a book to enjoy over spring break or anytime. UT Libraries, in partnership with the Toledo-Lucas County Public Library, offers popular titles available to borrow by students, faculty and staff. 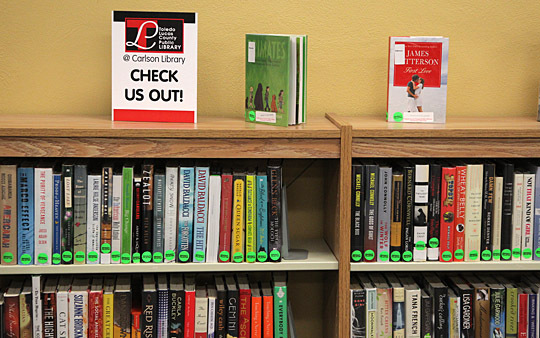 In December, UT Libraries renewed its agreement with the public library that provides University students and employees with a chance to check out popular fiction books usually unavailable on campus. A Rocket ID is the only thing needed to check out a book. The public library provides the books to the University so that students can read for enjoyment rather than just for study. The agreement between the two libraries has been in place since 2008. The public library provides books to encourage students to develop a lifelong reading habit, said Marilyn Zielinski, technical services manager for the Toledo-Lucas County Public Library. Many new titles have been added to the collection and are available for checkout in Carlson Library. Popular books also are available on Health Science Campus on the fourth floor of Mulford Library for students and employees, Floyd said. This entry was posted on Monday, February 29th, 2016 at 3:17 am and is filed under Library, UToday .